I'm not a big potato eater. Growing up, my sister was an absolute potato lover and would have lived off mash if she had had a choice but I was never too fussed. That said, a month or two ago, I was served some really delicious potatoes whilst staying with a friend and haven't been able to get them out of my head since! Over the Easter weekend, I had lunch with some of my girlfriends where we all bring a dish or two and have a bit of a pick'n'mix style meal. I decided it was a perfect time to get experimenting with potatoes and came up with something that was a huge hit among the girls! This dish works perfectly as a side or as part of a tapas style meal and is full of lots of flavour from the cumin and coriander. It is really simple to make and takes about 20 minutes to cook. No peeling necessary either - one of my real aversions to using potatoes more often! Start by quartering the potato and dicing the onion. Then place the olive oil, cumin and crushed garlic into a large pan over a media m heat. Add the onion and potatoes and stir well so that they are coated in the cumin, oily mix. Use a generous amount of salt and pepper to season. Place a lid over the potatoes and allow to cook gently for about 20 minutes, stirring every few minute to prevent burning or sticking and to make sure the potatoes cook evenly. While they the potatoes cook, finely chop the coriander and place to one side. 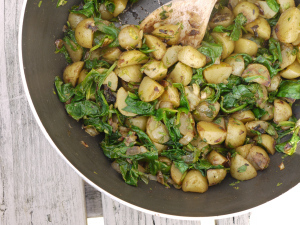 Once the potatoes start to soften and are almost ready, add in the spinach and coriander and stir until the spinach has wilted down and the potatoes are soft enough to eat. Remove from the heat and serve hot or cold.